The tears flowed freely back in February when Activision announced that the once-great Guitar Hero franchise was being put to rest following a rapid decline in interest among gamers. All work on a planned 2011 edition was canceled and the division that handled the series disbanded. Between the end of Guitar Hero and the cancellation at the same time of True Crime: Hong Kong, 500 jobs were lost. A few days later, Activision CEO Bobby Kotick said the publisher could bring the series back one day if the circumstances were right, although he made it clear that it wasn't a priority. But "could" is apparently now "will," according to Dan Winters, Activision's vice president of developer relations, and the only question is one of timing. "Just to clarify, we're just putting Guitar Hero on hiatus, we're not ending it. We're releasing products out of the vault - we'll continue to sustain the channel, the brand won't go away," Winters said in an interview with GamesIndustry.biz. "We're just not making a new one for next year, that's all." 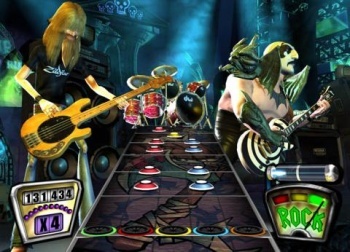 When the series might return with a new edition is impossible to predict, although as Winters noted the Guitar Hero brand remains at least marginally present in the public consciousness thanks to ongoing content additions like today's release of tracks by Paramore, Middle Class Rut, Madina Lake and Darkest Hour, none of whom I've ever heard of. But with the music game market as heavily saturated as it is, not just by Guitar Hero but also its arch-rival Rock Band, it's hard to imagine anyone seeing a near-term relaunch as a good idea. Oh, and that True Crime: Hong Kong thing? It's not necessarily dead either. Winters said Activision was "really confident" that it was going to be a very good game "that would have been, and might still be, a very successful mid-tier opportunity for someone," but that its focus is on "big, huge monster" titles like Call of Duty, Spyro and whatever it is Bungie is up to. "That left the True Crime title being a mid-tier opportunity which we felt was an opportunity cost against other things," he explained. "But we have a lot of confidence in the quality of the studio and the quality of the title, just not in the scale of the opportunity."